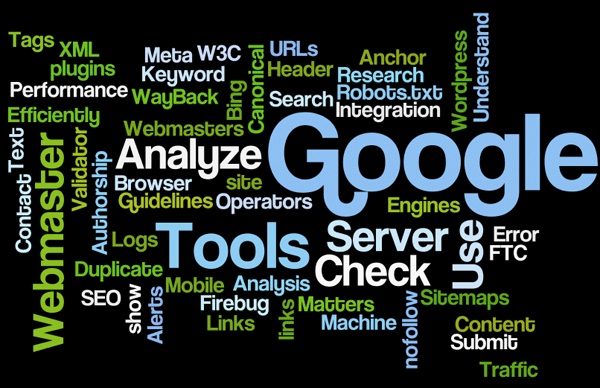 Continuation of 25 SEO Tips That Every Webmaster Should Know and so I will keep the numbering from 26. As expected this article focuses more on minute details. So if you are looking for worldwide audience to your site, you should opt for a general top-level domain or gTLD and not country specific top level domain or ccTLD. Google has its own list of general top-level domains here. Google shows lot of information in search engine’s results page and one such information is breadcrumb that any kind of site can use. The same may not be true for other such rich snippets like search a site or event information etc. For WordPress I prefer Breadcrumb NavXT but the plugin out of the box is not compliance with the Google’s Rich Snippet Guidelines but editing the Breadcrumb link template in the plugin is really simple and all you have to do is edit the breadcrumb links as follows. The idea is to wrap the link element with a span to provide the needed meta data for the breadcrumb. There is misconception for rating rich snippet. The misconception is that Google displays the rating of the content of the site but actually it shows rating of the product being reviewed in the content and not the rating of the content that user has written. As an example if I have reviewed a car on my blog then rating in Google’s search result will show rating for the car and not the rating for the article. So rating rich snippet is for product or review related sites or pages where you can display rating of the product in Google search result itself. 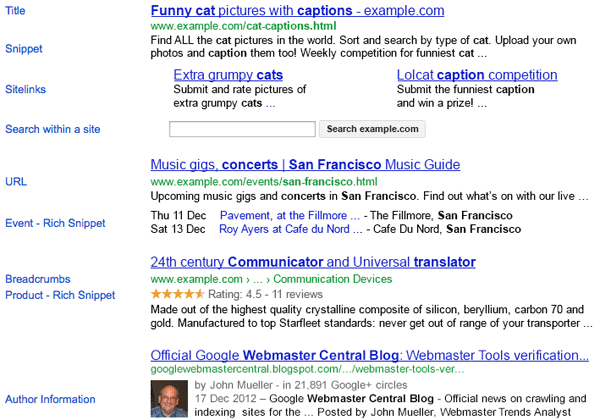 Like Rating there are quite a few rich snippets that you can be used depending on the type of site. If the site can have any of the rich snippets, make sure you add them. Use Google’s Rich Snippet Testing and Analyzing tool for testing your rich snippet output. All the links from the home page (or key pages as the case may be) may not be of same value, So it makes more sense if you allow your important pages to have the maximum link juice by making other links as nofollow. A simple example can be blog’s home page, which can link to the articles in multiple ways. The links that are not keyword rich like a Read More link or comment link can be made nofollow to pass more link juice from home page to the article page with keyword rich anchor text. Note: Privacy links, Terms of Services links, Contact Us Page Links should all be nofollow. Before 2005-ish time a link from a high PR page mattered the most but link building has evolved over time and so in 2005+ time links from high PR relevant pages mattered the most. Slowly but surely as Google tries to fight link spam, link building has evolved a lot more and what matters the most now is not only link from a high quality relevant page but also the placement of the link. A high quality page linking to a site from a content area has lot more impact than the same page linking to the same site from sidebar, header or footer area of the page. Deep Links Boost Authority of the Entire Site – Every internal page of your site link backs to the home page (Either In navigational menu or at least in logo) and so an external link to an internal page contributes to the overall authority of the domain but if the same external link points to the home page, it may not add so much value to the internal page but only to the home page. Variation of Anchor Text May not Help Rank the Home Page for all the key terms – Neither you can, nor you want to be ranking your home page for all the keywords for your site. Ideally we create different pages that can contain keywords in title, meta, url as well as in body that will help search engines crawl those internal pages and rank them for those terms. So it makes much more sense to be building links to those pages with anchor text related to key terms than getting links to home page with those terms. The Disavow tool helps you submit a list of sites or pages that you want your link to be removed but you cannot get it removed despite all your efforts. Disavow tools does not remove the links for you but it lets the search engine know that you would like it to be ignored. Note that Disavow tool is not cure for all bad links, so ideally you should be removing the bad links but if you cannot get links removed after all your efforts, its then only you should opt for a Disavow tool. Link Schemes and Link wheels. Any other link meant to game the search engine’s ranking. Few months back Google announced links from Press Releases should be nofollow like paid links (Read here). Manual spam action on a site is not an end of life. One school of thought is if you take an action on manual spam on your site, you confirm the spam but that is not what I believe in. I saw a manual spam action notice in August for Go4Expert.com and took the needed action and then filed for a reconsideration request. Within few days the manual spam action was revoked. According to me Manual spam action is a good sign because you have been told what you need to be doing to get that action revoked. If site is penalized for some action (unnatural links, thin content, site being slow), there are chances that it can be recovered from the penalty if the reason for the penalty is take care of but if the site is de-indexed by Google, its nearly impossible to get it back. It means the site was penalized for an elongated period of time and as the cause of the penalty was not worked upon, it slowly but surely was de-indexed by Google. It is the ultimate penalty that any site can get and it possibly means end of life for that site and domain. Content scrapers are sites that steal content from other sites without permission and post them on their site. Content scrapers can copy content manually but more often than not content scrapers use automated software to fetch content from RSS feed’s or parsing web page’s HTML to extract the content of the article. You can take the needed action based on the way content is being scrapped from your site. If you see lot of manual copy paste spam, you can add the link to your article when any one tries to copy the content. If content scrapers are using your site’s RSS, you can add link to your site in the RSS feed for your site. Image optimization can be an important part of building a successful website and here are few things that you should follow when using images in your web pages. Name the Images Correctly – You can always use the name that your camera uses for images like DSCN1415.jpg. However, it’s recommended to be naming the image files with the content of the image which in turn can help you rank well in Image searches for related terms. Always have an Alt Tags for Images – What if for some reason the image could not be loaded in user browser? Ideally you want them to be seeing something that makes sense as an alternative to an image. So not only it makes sense to be having an Alt tag for images but a descriptive alt tag. Use Exact Dimension Image – Loading a larger image in a smaller image area means your user need to be downloading lot of more data then actually needed and showing a stretched image may lead to bad user experience. In either case loading the exact size image is a solution. Use file type with minimum file size – All the images may not be of minimum size in one of the file type aka JPG or GIF or PNG. Opt for the one that has minimum size for your particular image. Yahoo’s SmushIt is an online tool to optimize images by removing unnecessary bytes from image files size without compromising on quality. There are other tools like PNG Crush and JPG Optimizer. SEO is a zero sum game, it means you will gain in ranking for a keyword only when someone else looses its position for that keyword. I have seen tons of links to my site from Russian domains with spam keywords. Definitely a case of Negative SEO. I was impacted badly for this and I had to get those links removed as well as Disavow those links. The Manual Spam Action Request that you see was for these links only. Recent SERoundtable published a study confirming what Matt Cutt said – Google+ Has No Direct Ranking Benefit. Even if +1 is not a factor in Search engine’s ranking as of today, (may be slightly based on MOZ Study) +1 is something which Google is pushing into almost every Google product (GMail, Adsense, Adwords, Tag Searches …) clearly suggesting is the future which Google is investing heavily into and so SEO may not be too far from being impacted with +1’s. Google’s PageRank™ to rank pages is not available in public domain and all those site that display PageRank (including may be a Google toolbar) is nothing but just a number that Google assigns to web pages. Recently Google even started encrypting all organic search queries that were being passed to Webmaster’s earlier clearly suggesting Google’s stand on not to share anything related to SEO with webmasters. Now if you expect Google to share their PageRank™ to rank pages, you are asking for too much. You may not be able to link to all the related articles of your site within the content but at the end of the articles, you can give your readers more content related to what they have just read. It not only helps your user to get involved more in your site but also helps in building deep links to related articles on your site. A/B testing is randomized experiments that have two variations, A and B to identify elements in the experiment that maximizes performance metrics. For making an A/B testing, you have to have multiple variation of the same page with very nominal changes in each other and so you need to take care of few things. Variation Page A does not have a 301 permanent redirect but a 302 temporary redirect to Page B. If you can, you should not be redirecting Google user agent and serve them Page A always. Variation page B does not get indexed in Google or else you may have duplicate content issues and so apply the meta tag “No Index” to the page B and also specify the canonical url to page A in the head of page B. Once the experiment is over, have a 301 permanent redirect from the page B to the page A.
A/B Testing requires A and B version of the page for performing the test but multivariate testing can be carried out by dynamically changing part of a webpage to display different content variations to visitors in equal proportion. So multivariate testing does not have impact the SEO from the url’s point of view but need to be careful about changing the key elements of the page like Title of the page or content within the Hx element. 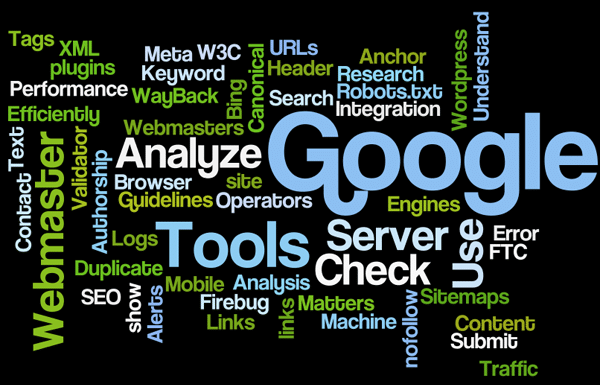 Google may see change in keywords in key area of the site. Google encourages A/B testing as well as Multivariate testing and provides guidelines for testing to get more visitors and conversions on your website. Its just you have to follow the guidelines. SEO is ever changing; so to keep up with changes, SEO efforts needs to be on going. At times focus may change from one aspect of SEO (like link building) to other aspect of SEO (may be content). After almost 5000+ words on SEO tips for Webmaster the final thought should be really sweet, simple and short which is – Don’t Try to Game the Search Engines, Play with them.